As you can see, it isn’t very easy to get photos of these two in our house! The photos are the reason I get behind on these little updates; trying to get both babies in a reasonably good mood, dressed in nice clothes and in a tidyish corner of the house can be quite difficult. Add to that a curious, energetic two year old and I just give up most days. Poor Brandon in looking so tired on these photos, he was ready for his nap but was still quite happy to have a quiet moment so I could snap away. They are due a weigh in next week but just looking at them I can see they are coming along brilliantly. They are actually exactly three months old today but they have only just gone into 0-3 months clothes however their long legs mean I can get away with 3-6 in trousers. To me they look so big now, especially compared to when they were born but I suppose they are still quite small compared to other babies. We have really settled into a little routine so much so that I can find it difficult at weekends when it all goes to pot. They will sleep from after their 10.30pm feed through to around 6am which has made a massive difference to all of us. They just did it themselves and I couldn’t believe it when we woke up without a feed in the night, I actually asked my husband if we had been up and I’d forgotten! They are both incredibly happy babies, such a joy to be with and even in the middle of crying will often stop to flash you a smile, before starting up crying again! They love to be in the bath and will happily sit in their splashing and gurgling away; I sometimes stick them in the bath early just because they enjoy it so much and it calms them down in that terrible hour before bedtime. We have these great baby bath chairs that I can put in the big bath so I can bath them on my own if my husband isn’t home from work. They have started to smile and gurgle at Lucas this week which is lovely but I still have to watch him like a hawk because he does have a tendency to attack their feet. He loves to be near them and touch them but it’s hard to restrain him when he gets too excited and I have to remind him that they are little. I think he is so used to wrestling with his cousins it’s hard for him to understand to be careful with these two. Arthur will roll over to his side now and Brandon is just starting to make the move to. I’m trying to get them both to do tummy time but it never seems to be very successful, I probably managed maybe two minutes with Brandon and Arthur is just not having it at all! They are starting to take notice of toys around them and are holding their hands in front of their faces and studying them. There is so much I have forgotten about baby development and I’m just taking it all as it comes this time, it’s so lovely to watch them change and grow; getting that little bit nearer to being little boys! They are so adorable. 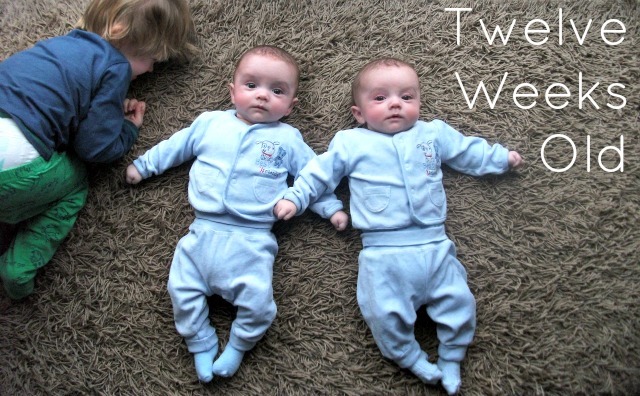 I have always wanted twins so badly my whole life. So envious. 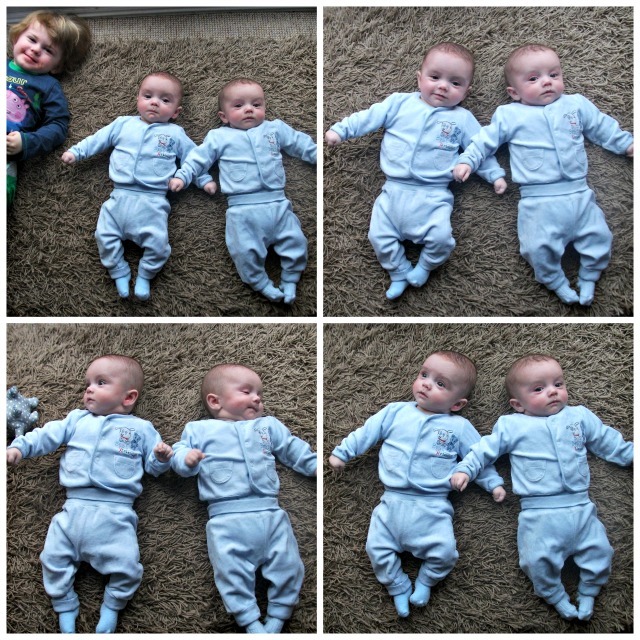 Looks like you did a fantastic job on the photos and getting them dressed, cute, and together. i struggle with my two yo and 9 mon old too they always want to roll away, run away not look forward or just stare at each other. Pictures are a nightmare to get of them, well good ones. This is such a lovely post. So sweet.